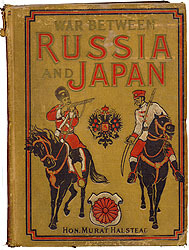 A picture of my old copy of War between Russia and Japan, containing thrilling accounts of fierce battles by sea and land including the causes of the greatest conflict of modern times; vivid descriptions of superb heroism and daring exploits; narratives of personal adventure, etc., etc. by Murat Halstead (1829-1908). This was a war in which my grandfather fought in the Russian army against the Japanese. Read the textbook chapter 31 and pages 397-99. Read the American ambassador's account of Bloody Sunday. Check the remarks by Professor Blois and Professor Evans on the 1905 Revolution. Read The Fleet That Had to Die (1958) by Richard Alexander Hough. I highly recommend this book which tells the amazing story of the Russian Baltic fleet that was ordered to the Far East in 1904. See my capsule summary of what happened. Believe me, you will not believe what you read in this book. There is also another study of the voyage by Constantine Pleshakov, The Tsar's Last Armada: The Epic Voyage to the Battle of Tsushima (2002). Read the supplement from Mary Platt Parmele (1843-1911) A Short History of Russia (1907, 4th edition). This is optional reading. For 50 points maximum extra credit, watch Bronenosets Potemkin (Battleship Potemkin) and assess the historical accuracy of the movie in a one-page paper. For 50 points maximum extra credit, read the account of the Potemkin mutiny in Russia and then compare to the movie version of the mutiny in a one-page paper. For 50 points maximum extra credit, watch Mat (Mother) and write a one-page paper about the portrayal of life in Russia in the late nineteenth century. For 50 points maximum extra credit, read Walter Sablinsky, The Road to Bloody Sunday: Father Gapon and the St. Petersburg Massacre of 1905 (1976) and write a one-page paper assessing blame for the massacre. For 50 points maximum extra credit, read Trotskii, 1905 (1922) and write a one-page paper analyzing his account of the 1905 Revolution. For 50 points maximum extra credit, read Peter Waldron, Between Two Revolutions: Stolypin and the Politics of Renewal in Russia (1998) and write a one-page paper in which you assess the policies of Stolypin. For 25 points maximum extra credit, read some details about the proposed "Bulygin Duma" of 1905, and write a paragraph assessing the pros and cons of the proposal; compare to what the tsar actually proposed in August 1905. For 25 points maximum extra credit, read the The Socialist-Revolutionaries' Assassination of Interior Minister von Plehve, July 1904 (pamphlet) and write a long paragraph about the use of terror as a political weapon by the Socialist Revolutionary Party. For 25 points maximum extra credit, read the American embassy's account of October General Strike in Russia and write a paragraph explaining the scale and scope of the strike movement.